The Cumberland & Dumfriesshire Farmers Mart P.L.C. 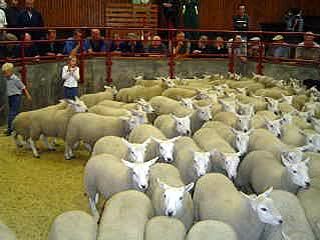 had forward 2,753 head at their weekly sale of store hoggs at Longtown on Tuesday 12th January 2010. Store hoggs met the dearest trade ever recorded, selling to a top of £89.50 for Charollais’ from Springwells; Texel £87.50 Crumhaugh Hill, £84.50 Newbiggen, £81.50 Haithwaite; Suffolk £84.50 Newbiggen, £84 Lordstown. Greyface £80.50 Springwells, £77.50 Linton House; Lleyn £74.50, £73.80 Rammerscales; Bleu d’Maine £69.50 Newbiggen; Beltex £69.50, £67.50 Greenside; Blackface £66.50 Albierigg, £65.50 Craig Farm; Cheviot Mule £62.50 Falnash; Hill Cheviot £60 Pennine View, £59.80 Lowfield Cottage; Swaledale £56.50 Albierigg; Kendal Rough £53.50 Beechcroft. Cast ewes to £147.50 West Craigs, hill types to £64.50 Oakbank, cast rams £128.50 Pennine View.